This does not grow as well as the mustard, but tastes better and goes well in salad as a lettuce substitute. The stalks could also be used as a celery substitute, though they are generally a lot thinner and flimsier. I can’t remember where I got the seed from and I have a few old commercial seed packets. They require a bit more work. The soil should be turned over and mulched a bit, and they need more water. 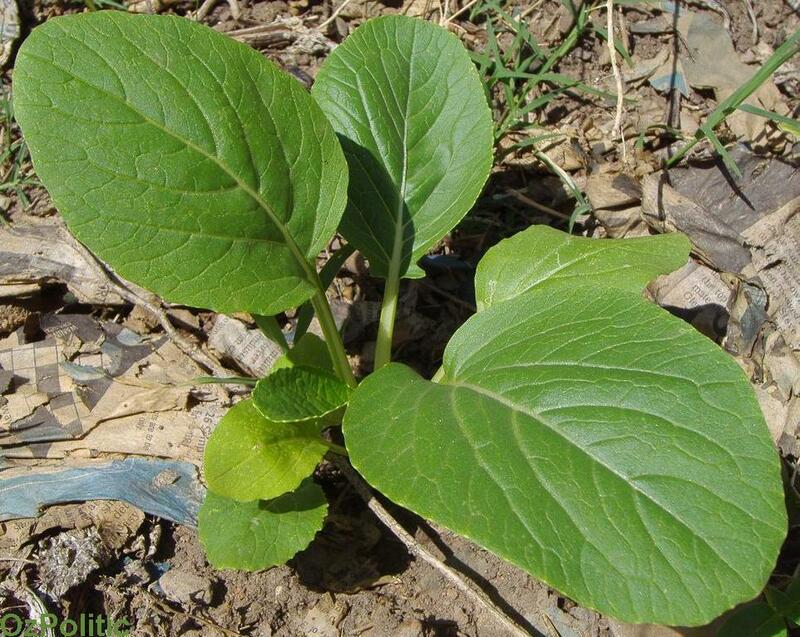 Pak choy goes to seed in a manner very similar to mustard and the slightly larger seeds are also easy to collect. Chinese cabbage (Brassica rapa, chinensis group; pinyin: báicài; Cantonese bak choi) is a Chinese leaf vegetable related to the Western cabbage. They are of the same species as the common turnip. There are many variations on its name, spelling, and Scientific classification. This is a common vegetable used in Chinese cuisine. There are two distinctly different groups of Brassica rapa, and a wide range of varieties within these two groups. The binomial name B. campestris is also used. The Pekinensis group is the more common of the two, especially outside Asia; names such as da baicai (lit. "large white vegetable"); petsay/pechay (Tagalog); Chinese white cabbage; nappa, or napa, cabbage; and hakusai (Japanese) usually refer to members of this group. Pekinensis cabbages have broad green leaves with white petioles, tightly wrapped in a cylindrical formation and usually, but not necessarily, forming a compact head. As the group name indicates, this is particularly popular in northern China around Beijing (Peking). The Chinensis group was originally classified as its own species under the name B. chinensis by Linnaeus. When used in English, the name bok choy typically refers to Chinensis. Smaller in size, the Mandarin term xiao baicai ("small white vegetable") as well as the descriptive English names Chinese chard, Chinese mustard, celery mustard and spoon cabbage are also employed. Chinensis varieties do not form heads; instead, they have smooth, dark green leaf blades forming a cluster reminiscent of mustard or celery. Chinensis varieties are popular in southern China and South-East Asia. Choy sum (pinyin: càixin; literally "vegetable heart"; also baby bok choy), can refer to either a small, delicate version of bok choy or simply the flowering heart of any Chinese cabbage. It might also refer to the heart of Shanghai bok choy. Shanghai bok choy (pinyin: Shànghai báicài; Japanese: chingensai) refers to dark green varieties where the varioles are also green. It's probably the most common vegetable in Shanghai, where it's simply called qingcai ("green vegetable"). In Mandarin Chinese bai cai ("white vegetable") refers to both groups of B. rapa. However, the English word bok choy and its variations bok choi and pak choi are derived from the Cantonese cognate, which instead denotes one specific variety of cabbage, namely those with white stems and dark green leaves. The other varieties all have different names which entered the English language as you choy, choy sum, napa and baby bok choy, etc. Hence the English word bok choy (and its Cantonese source) is not equivalent to the Mandarin word bai cai, though the Chinese characters are the same. Chinese cabbage has been cultivated for over six thousand years. Brassica rapa seeds have been found in jars in the excavated New Stone Age settlement of Banpo. They were a common part of the diet in southern China by the 5th century. The Ming dynasty pharmacologist Li Shizhen studied the Chinese cabbage for its medicinal qualities. Before this time the Chinese cabbage was largely confined to the Yangzi Delta region. The Chinese cabbage as it is known today is very similar to a variant bred in Zhejiang around the 14th century. During the following centuries, it became popular in northern China and the northern harvest soon exceeded the southern one. Northern cabbages were exported along the Grand Canal to Zhejiang and as far south as Guangdong. They were introduced to Korea in the 15th century, where it became the staple vegetable for making kimchi. In the early 20th century, it was taken to Japan by returning soldiers who had fought in Manchuria during the Russo-Japanese War. At present the Chinese cabbage is quite commonly found in markets throughout the world. Separate the leaves and wash well. 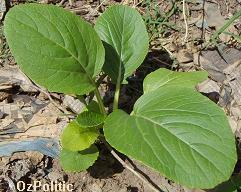 The green leaf is often cooked separately to the much thicker, paler stalk. In a stir fry, cut off the stalks and slice. Cook for a couple of minutes before adding the leaves for 2 minutes. Use it in stir fries, chopped in salads or add to a soup for the last few minutes of cooking. For a quick recipe, chop it and steam for 3-4 minutes. Serve with soy sauce and toasted sesame seeds.